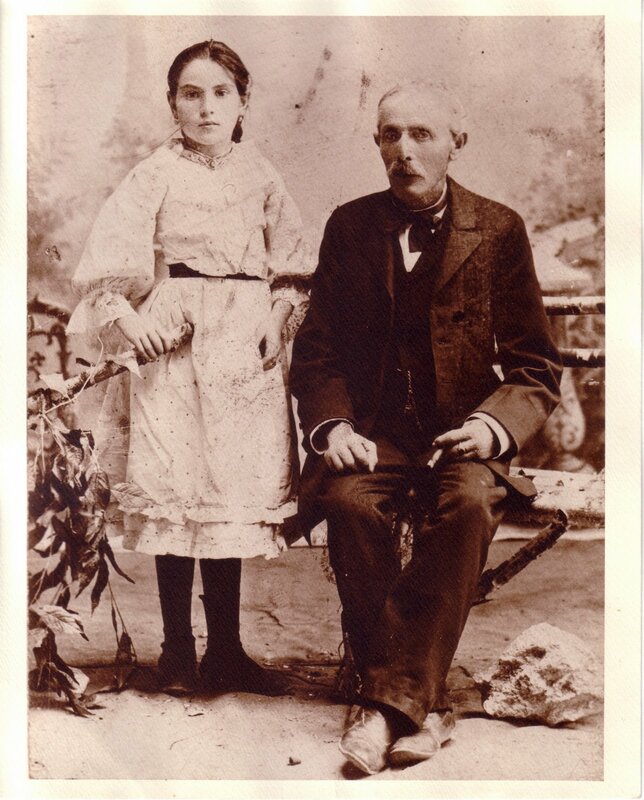 my great-great-grandmother ella used to tell people that her father was the bootblack to emperor franz josef of austria. instead, her father was a tavern-keeper in a small town in hungary (now, slovakia) where he probably never set eyes on the emperor, but nonetheless raised at least 7 children over 30 years with (possibly) three different wives and immigrated to the united states in his 80s. this might not be as impressive as shining the emperor’s shoes, but it’s still not half bad. that is jacob, sitting there with his cigar and his youngest daughter, margaret. he looks uncannily (i think) like ella’s son, my great-great uncle stanley, who turned 97 this past june and still plays bridge on occasion, even though he doesn’t quite recall all the rules anymore. margaret, on the other hand, ella’s younger sister, does not look like anyone i know. a beautiful little girl, she grew up into a beautiful young woman. i am not sure if she grew into a beautiful old lady, but i don’t want to know if she didn’t. margaret and jacob came to the united states in 1908 – or rather, they were fetched and brought here by ella, my toddler great-grandmother rona, and aunt rose, jacob’s oldest daughter. the three ladies sailed to europe for a visit, and returned with their little sister and their elderly dad. in hungary, they would have seen their brother, adolph – the only sibling of the 7 who chose to stay in europe and died with his wife and 2 of his daughters in auschwitz – and the other members of their extended family. after leaving the urbanity of chicago, where ella and rose had both lived for more than 12 years, coming home to little rural rudno would have been quite a shock. i have seen pictures of it now – a little rural hamlet that would have been even more rural and hamlet-like in 1908.
when they all returned to chicago, jacob lived with ella, and her husband sam, and rona (later joined by little stanley) until his death in 1912. i’d like to imagine that this was a peaceful time, though i can’t wholly convince myself that it would have been, given the personalities contained in their house on paxton avenue. margaret, during this time, was basically adopted by rose, the maiden sister old enough to be her mother (30 years, approximately, separated them). sometime in the early teens, the two sisters moved to san diego, california, perhaps because one of them (margaret?) had some kind of health problem that was ameliorated by the warm climate and lack of winter. rose grew into an old lady who later chaperoned a teenaged rona to hawaii; margaret grew into a lady who married an anti-semite, hid her jewishness her whole life and lived on a farm in san ysidro where my grandmother was horrified by bugs on the vegetables. but those are both stories for another time, for other pictures.